Arriving at the festival grounds feels a bit like coming home. It's only my second full weekend at FolkEast yet I immediately feel the kind of familiarity and the warm welcome that you would normally associate with coming home. And that is what really makes this to perhaps my favourite weekend of the year. Folk East is very special. Somehow organisers Becky and John have created a large festival that provides the intimacy and relaxedness of an English village fete, while in every other way it offers all that big festival should offer. There is wonderful food on offer, a huge choice of local beers (£3 a pint! ), there's the smallest pub in the country (in a small shed where there's hardly space for a single customer to join the barman). Plenty of activities to keep the little ones amused. A knitting tent, craft stalls, storytelling, sports day, plenty of Morris dancing and so much more. Quirky artworks. Two main music stages, plus a ceilidh dance stage and two cosy smaller stages – one of them entered through a fairy wood. All this in the stunning parkland of Glemham Hall in Suffolk. And any activities, as well as all stages and the wonderful camping grounds, are not much more than a stone throw from each other. FolkEast is one of those festivals where regulars are happy to go no matter who is playing – and are happy to buy next year's advance tickets without knowing the lineup. This year, I arrived already on Thursday to set up my tent which made a very pleasant and chilled-out start to the weekend. Food and, more importantly, the full choice of local ales were already available on site, and whilst normally there wouldn't be any music programme, this year a wedding of two folkies resulted in ceilidh band playing for the wedding - with everybody was welcome to join in! My family's favourite ceilidh band Stumpy Oak played, and my two daughters – and us adults too - loved to join in. Perhaps this should become an annual feature (well the Thursday ceilidh i mean not necessarily a wedding!)? In FolkEast you can be certain that, in addition to the wonderful relaxed atmosphere, there will be a first class lineup. The main focus tends to be on English folk stars, so this year's lineup included Sam Kelly and his band, wonderful trio Moirai featuring Jo Freya, the Willows, the breathtaking accordion/harmonica duo Will Pound & Eddy Jay, and homegrown young Suffolk singer songwriter Tilly Moses with her band presenting charming new songs. 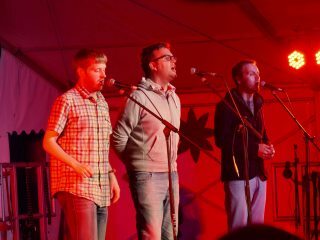 The festival patrons returned this year with their own concert slot - the Young’Uns played a superb set of their exquisite three way harmony songs from their wonderful new album “Strangers”. 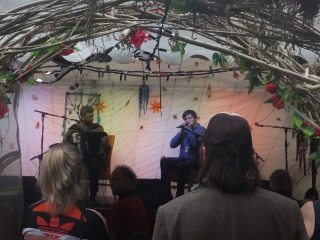 After last year’s success, they also presented another hilarious podcast (where David Eagle attempted some pottery, the trio and guests played "guess the age of folk musicians" game, and there was a herbal tea tasting on stage – as well as performances of some of the festival artists). To represent the Celtic world, this year’s festival featured a high powered set of Irish stars Beoga – who have been to Suffolk not too long ago on invitation of local pop superstar Ed Sheeran to record on his album. Ed Sheeran himself could be found at the festival too – well not quite life sized, but the knitted Ed looked just like the real one! I also particularly enjoyed an intimate performance of Scottish Gaelic singer Mary Ann Kennedy. 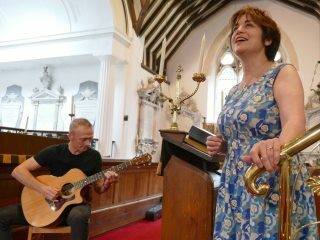 She played a beautiful acoustic set in a church, a five minute walk away from the main festival ground past the glorious Glemham Hall. Despite the festival being so quintessentially English and having a focus on English folk, perhaps surprisingly my personal highlights were this year’s world music acts. Slovenian band Terrafolk played one of their first UK performances in years, with their heady instrumental music - and when the sound system was switched off due to the 12am curfew, the quartet gave an acoustic encore off stage in the middle of the audience. Korrontzi was my personal highlight of the festival - a basque band around a trixipeltra accordion player featuring also two dancers. Korrontzi achieved what not many bands do in an afternoon concert at Folk East – managing to get the whole audience up to dance. 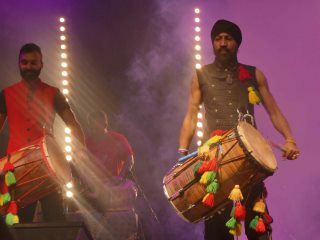 The final main act was Indian percussion band Dhol Foundation with their loud and powerful Bollywood inspired music. 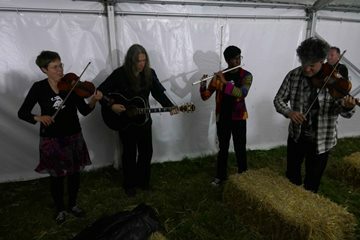 Many folk musicians state that FolkEast is their favourite weekend in the year, and don't be surprised to find professional folk musicians in the audience who are not booked. This year the festival has proven once again that it is one of the premier folk festivals in the country. Put the dates for 2018 into your diary: 17th, 18th and 19th August 2018. 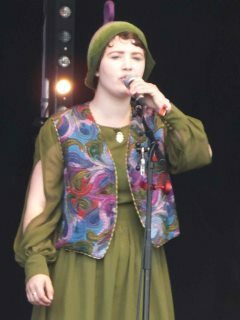 Photo Credits: (1) Korrontzi, (3) Tilly Moses, (4) The Young’uns, (5) Will Pound & Eddy Jay, (6) Mary Ann Kennedy, (7) Terrafolk, (8) Dhol Foundation (by The Mollis); (2) FolkEast (unknown/website).